Evergreen is the continuation of Alpine Kush. 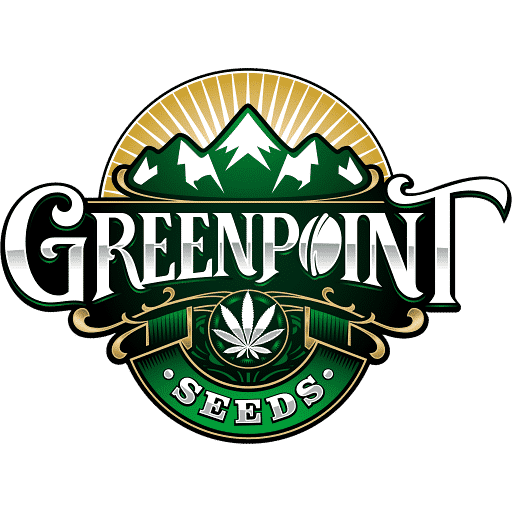 Alpine Kush is a discontinued variety of Greenpoint’s very own making. 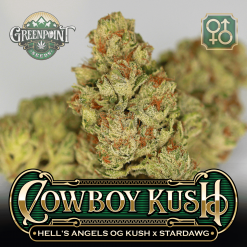 A three-way cross of the Hollywood Pure Kush, Polar Bear OG, and Bodhi’s Appalachia, Alpine Kush is a poly hybrid encompassing some of the most sought-after genetics in cannabis today. The Hollywood Pure Kush clone only is known for her mesmerizing indica effect and marshmallow/hashish flavor. Bodhi Seeds crossed her to his fruity-chemical Appalachia male, creating Pura Vida, a variety meant to be “good life” bud, or cannabis used to facilitate pure living. Evergreen is the continuation of Alpine Kush. 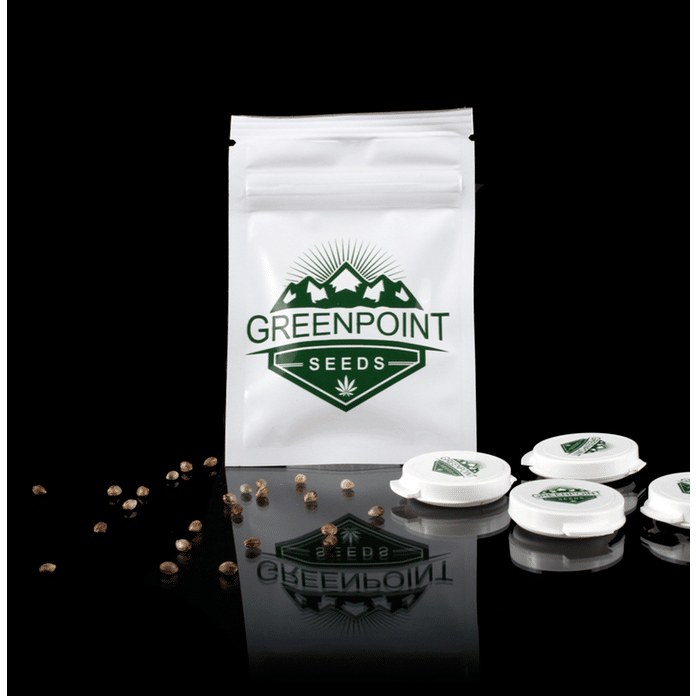 Alpine Kush is a discontinued variety of Greenpoint’s very own making. 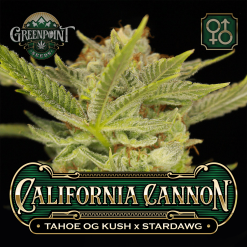 A three-way cross of the Hollywood Pure Kush, Polar Bear OG, and Bodhi’s Appalachia, a poly hybrid encompassing some of the most sought-after genetics in cannabis today. The Hollywood Pure Kush clone only is known for her mesmerizing indica effect and marshmallow/hashish flavor. Bodhi Seeds crossed her to his fruity-chemical Appalachia male, creating Pura Vida, a variety meant to be “good life” bud, or cannabis used to facilitate pure living. 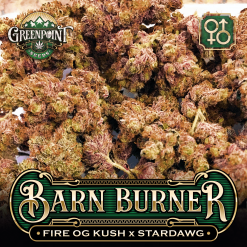 At Greenpoint, the super-frosty Pura Vida was crossed to the Polar Bear OG (possibly the epitome of OG plants) from Karma Genetics to make the Alpine Kush. The Polar Bear OG male did not breed as we expected in most cases, but he did well lending himself to the Pura Vida clone. Our Alpine Kush is a frost-covered monster, producing green buds that appear pale and almost white due to the sheer resin content. She was begging to be bred with, and the Stardawg male was an obvious choice. 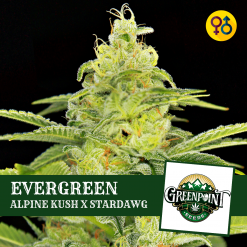 Evergreen plants stay green unlike many of Stardawg’s offspring. 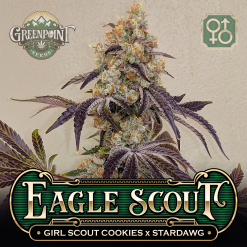 Where Evergreen lacks in color, she makes up for in resin content, producing an almost-unbelievable amount of trichomes. Her quantity of resin makes her popular for extract artists of all sorts and gives her a bag appeal that is unprecedented in green flowers. This one will yield well both in the rosin press or with solvents. Germ rate of 8 out of 10(one was mutant). Growing fast and vigorous. Hoping to find an Alpine Kush pheno our of these. All are healthy and looking good structure wise. Will throw in flower in two weeks and will update their progress along the way. Don’t think I could go wrong with Greenpoint and Bodhi bringing these parents to the table but only time will tell. Next up in a couple weeks is Sundance Kid, can’t wait! Thanks and keep up the great work on finding genetics for the masses! This plant is on point. Ive had it for over a year and money was tight so the last runs of it was very below averqge. I still kept her because i was too broke to get anything else lol.